San Francisco doesn't have Radio City Music Hall, or ice skating at Rockefeller Center under the huge Christmas tree or snow or the Macy*s Christmas parade, but we did have downtown and we did have our own special "magic" when I was a kid. You "dressed up" to go downtown. That meant your best dress, patent leather shoes, gloves, and perhaps even a hat. We sometimes took the cable car, because it ran just a block from our house. In the 1940s-50s, it only cost 10-15 cents for kids to ride and you could get on in the middle of the route because it wasn't already packed to the rafters with tourists who boarded at Fisherman's Wharf. Downtown always showed its best face at Christmastime. All those Salvation Army bell ringers at the door to every department store, and all the windows decorated with Christmas finery. Of course, the very best windows were at The Emporium. 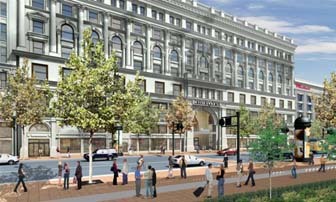 The Emporium (it's now the San Francisco Center mall) had windows which stretched along a good portion of Market Street at Powell (where the cable car ended). They always had mechanical figures in the window, lovely home scenes, of families gathered around the Christmas tree, kids playing with toys, pets sleeping by the fire, or cute little animals doing things like ice skating. The Emporium was our "Christmas store." Macy*s was only a couple of blocks away, but The Emporium was bigger and had more exciting stuff. Santa was there and I remember the feeling of anticipation and terror as we rode the escalator up to the 4th floor toy department and stood in the long line of kids waiting to tell Santa what we wanted for Christmas. The butterflies in my stomach began doing battle with each other as we got closer and could hear the "ho-ho-ho" coming from Santa. Then there was the brief moment, my big opportunity to make my wishes known and then the great relief after our picture had been taken and we left the jolly man again. But that wasn't the end of our time at The Emporium. It was time for the roof rides! The building had a lot of little kiddie rides on the roof. They were, for the most part, pretty tame, but the ferris wheel was particularly scary because even though it was a fairly small wheel, when you got to the top, you weren't looking down to the roof, but to the street, which was five stories below. We also loved to visit the City of Paris (now Nieman Marcus). It had a tree which went from the floor up to the ceiling, several stories above the ground floor. Nieman Marcus continues the tradition, but they have more of a fancy frou-frou kind of tree. The fun of the City of Paris tree was the variety of ornaments, dolls, toys, and different things to check on each floor. My mother made Christmas cookies. 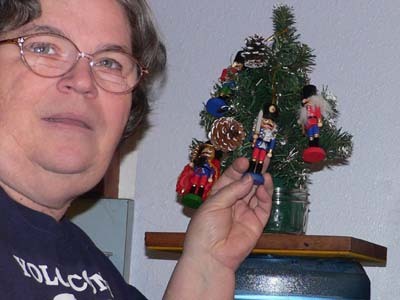 I don't know if she made them every year, but she made them a lot of years. Nothing says "home" like the smell of baking cookies wafting through the house! I remember when she made thumbprint cookies, which were balls of orange-flavored dough, rolled in walnuts, with a teaspoon of jam in the depression that was made by pushing a hole into the dough after it was placed on the baking sheet. But my favorites were what she called "Goodness Sake Cookies," which I have since found in books under several names, most commonly "Mexican Wedding Cakes." But they were called "goodness sake cookies" because they were so delicious when you bit into them, that you would say "Oh--goodness sakes!" When I moved into my own apartment and had a job working for the Physics Department at UC Berkeley, I had my own office, so I held an open house each Christmas. Darn near killed me staying up late at night making cookies (to say nothing of the expense) but I loved doing it and everybody in the building at one time or another during the week before Christmas stopped by to sample some of the cookies. I made them all--rolled cookies, ball cookies, cut cookies, hard cookies, frosted cookies, soft cookies, cookies which came out of a cookie press, brownies, shortbread, etc. I had a great baking cookbook that was my bible during that time, but when I recently did a huge cookbook purge, I gave it away because I figured the last thing I needed was a book to remind me of all those great cookies I used to make. I think that the sounds and the smells of Christmas are the things that take me back to the time when I was a child, when Christmas was a magic time. I wonder if my kids remember cookies baking in our kitchen which we packed up to give as gifts, or decorating gingerbread men and gingerbread houses, or if their principal memory of the Christmases of their childhood is "Mom's Christmas Crisis" each year. I'm hoping that with the arrival of Tom & Laurel's little one next year, we can eventually start watching the wonder of Christmas through her eyes and get back a bit of that glow that I remember so fondly from my childhood.